Sometimes a full size CIF or D1 resolution video recording system just isn’t quite enough. There are times you may want a larger, high quality resolution display & recording especially to present as legal evidence. The 8 channel 960H Security DVR included in the package ensures high quality live viewing and recording that is a 34% increase over standard D1 resolution and 500% of CIF. Coupled with 700TVL high resolution night vision cameras, this premium system offers a larger, sharper, undistorted image with a truer aspect ratio that enhances surveillance. With this 960H surveillance system, you can monitor high traffic areas with confidence in high resolution, and you will know you’ve picked a top-of-the-line security system at an affordable price.That’s when it time to move up to our premium 960H video surveillance system. 960H is a new standard for security DVRs that provides high resolution images at an image size of 960 pixels horizontal and 480 pixels vertical.The DVR offers 960H (960x480) real-time recording on all 8 channels at 30fps. 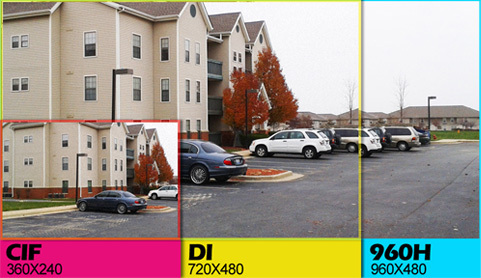 960H DVR provides superior images that are 34% larger than D1 and more than 500% larger than CIF. 960H creates a wide-screen picture that does not need to be stretched to fit wide-screen TV's and monitors. Recording larger images provides a greater amount of image detail. Images are sharper and shows more detail in objects and colors. Keep watch over the things that matter to you most from anywhere at any time, offering you peace of mind at the tip of your fingers. Both PC & Mac compatible. Compatible Devices: iPhone, iPad, Android, Symbian, Windows Mobile and Blackberry. Compatible Internet Browsers: Firefox, Chrome, Safari and Internet Explorer. 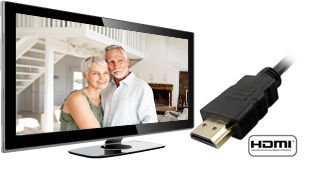 With the HDMI® port, easily display video on any 19” or larger TV or monitor to take full advantage of the security system's clarity. Easily focus on the details. (HDMI Cable Not Included). The amount of footage you can save on the hard drive before needing to over-write footage will depend on the recording and resolution settings you select. The system supports 1 SATA hard drive up to 2TB (No hard drive is also available). Cameras perform both in outdoor and indoor applications with professional-grade aluminum housing and sunshade. Supports normal playback, fast forward playback, rewind playback, manual single-frame playback, you can also simply drag the playback progress bar to quickly locate the playback time. It also supports multi-channel playback simultaneously, and each channel can be enlarged into full screen. Dimensions (W x D x H) 4.3" x 4.3" x 3.3"